Doxepin is a medication used to treat major depressive disorder, anxiety disorders, chronic hives, and trouble sleeping. For hives it is a less preferred option to antihistamines. For sleeping problems it has a mild to moderate benefit. As a cream it is used for itchiness due to atopic dermatitis or lichen simplex chronicus. Common side effects include sleepiness, dry mouth, constipation, nausea, and blurry vision. Serious side effects may include suicide in those under the age of 25, mania, and urinary retention. A withdrawal syndrome may occur if the dose is rapidly decreased. Use during pregnancy and breastfeeding is not generally recommended. It is a tricyclic antidepressant (TCA). While how it works for treating depression is unclear, it may involve increasing the levels of norepinephrine. Although it also has antihistamine, anticholinergic, and antiserotonergic effects. Doxepin was approved for medical use in the United States in 1969. It is avaliable as a generic medication. A month supply in the United Kingdom costs the NHS at least 100 £ as of 2019. In the United States the wholesale cost of this amount is about 23 USD. In 2016 it was the 239th most prescribed medication in the United States with more than 2 million prescriptions. Doxepin is used as a pill to treat major depressive disorder, anxiety disorders, and chronic hives, and for short-term help with trouble remaining asleep after going to bed (a form of insomnia). As a cream it is used for short term treatment of itchiness to due atopic dermatitis or lichen simplex chronicus. In 2016 the American College of Physicians advised that insomnia be treated first by treating comorbid conditions, then with cognitive behavioral therapy and behavioral changes, and then with drugs; doxepin was among those recommended for short-term help maintaining sleep, on the basis of weak evidence. The 2017 American Academy of Sleep Medicine recommendations focused on treatment with drugs were similar. A 2015 AHRQ review of treatments for insomnia had similar findings. Its use in pregnant and lactating women is advised against, although the available evidence suggests it is unlikely to cause negative effects on fetal development. The lack of evidence from human studies, however, means it is currently impossible to rule out any risk to the fetus and it is known to cross the placenta. Doxepin is secreted in breast milk and neonatal cases of respiratory depression in association with maternal doxepin use have been reported. Doxepin is licensed to be used in much smaller doses (viz., 3 mg and 6 mg) in some countries the side effects' profile of which may differ from this list. Others: frequently increased appetite and weight gain, rarely nausea, rarely high blood pressure. May increase or decrease liver function in some people. Like other TCAs, doxepin is highly toxic in cases of overdose. Mild symptoms include drowsiness, stupor, blurred vision, and excessive dryness of mouth. More serious adverse effects include respiratory depression, hypotension, coma, convulsions, cardiac arrhythmia, and tachycardia. Urinary retention, decreased gastrointestinal motility (paralytic ileus), hyperthermia (or hypothermia), hypertension, dilated pupils, and hyperactive reflexes are other possible symptoms of doxepin overdose. Management of overdose is mostly supportive and symptomatic, and can include the administration of a gastric lavage so as to reduce absorption of the doxepin. Supportive measures to prevent respiratory aspiration is also advisable. Antiarrhythmic agents may be an appropriate measure to treat cardiac arrhythmias resulting from doxepin overdose. Slow intravenous administration of physostigmine may reverse some of the toxic effects of overdose such as anticholinergic effects. Haemodialysis is not recommended due to the high degree of protein binding with doxepin. ECG monitoring is recommended for several days after doxepin overdose due to the potential for cardiac conduction abnormalities. Doxepin should not be used within 14 days of using a monoamine oxidase inhibitor (MAOI) such as phenelzine due to the potential for hypertensive crisis or serotonin syndrome to develop. Its use in those taking potent CYP2D6 inhibitors such as fluoxetine, paroxetine, sertraline, duloxetine, bupropion, and quinidine is recommended against owing to the potential for its accumulation in the absence of full CYP2D6 catalytic activity. Hepatic enzyme inducers such as carbamazepine, phenytoin, and barbiturates are advised against in patients receiving TCAs like doxepin owing to the potential for problematically rapid metabolism of doxepin to occur in these individuals. Sympathomimetic agents may have their effects potentiated by TCAs like doxepin. Doxepin also may potentiate the adverse effects of anticholinergic agents such as benztropine, atropine and hyoscine (scopolamine). Tolazamide, when used in conjunction with doxepin has been associated with a case of severe hypoglycaemia in a type II diabetic individual. Cimetidine may influence the absorption of doxepin. Alcohol may potentiate some of the CNS depressant effects of doxepin. Antihypertensive agents may have their effects mitigated by doxepin. Cotreatment with CNS depressants such as the benzodiazepines can cause additive CNS depression. Co-treatment with thyroid hormones may also increase the potential for adverse reactions. Values are Ki, unless otherwise specified. The smaller the value, the more strongly the drug binds to the site. Based on its IC50 values for monoamine reuptake inhibition, doxepin is relatively selective for inhibition of norepinephrine reuptake with much weaker effects on serotonin reuptake and negligible influence on dopamine reuptake. The major metabolite of doxepin, nordoxepin (desmethyldoxepin), is pharmacologically active similarly, but relative to doxepin, is much more selective as a norepinephrine reuptake inhibitor. In general, the demethylated variants of tertiary amine TCAs like doxepin are much more potent inhibitors of norepinephrine reuptake, less potent inhibitors of serotonin reuptake, and less potent in their antiadrenergic, antihistamine, and anticholinergic activities. Antidepressant doses of doxepin are defined as 25 to 300 mg/day, although are typically above 75 mg/day. Antihistamine doses, including for dermatological uses and as a sedative/hypnotic for insomnia, are considered to be 3 to 25 mg, although higher doses between 25 and 50 mg and in some cases even up to 150 mg have been used to treat insomnia. At low doses, below 25 mg, doxepin is a pure antihistamine and has more of a sedative effect. At antidepressant doses of above 75 mg, doxepin is more stimulating with antiadrenergic, antiserotonergic, and anticholinergic effects, and these activities contribute to its side effects. Doxepin is a mixture of (E) and (Z) stereoisomers with an approximate ratio of 85:15. When doxepin was developed, no effort was made to separate or balance the mixture following its synthesis, resulting in the asymmetric ratio. (Z)-Doxepin is more active as an inhibitor of serotonin and norepinephrine reuptake than (E)-doxepin. The selectivity of doxepin for inhibition of norepinephrine reuptake over that of serotonin is likely due to the 85% presence of (E)-doxepin in the mixture. Most other tertiary amine TCAs like amitriptyline and imipramine do not exhibit E-Z isomerism or such mixture asymmetry and are comparatively more balanced inhibitors of serotonin and norepinephrine reuptake. Doxepin is a highly potent antihistamine, with this being its strongest activity. In fact, doxepin has been said to be the most or one of the most potent H1 receptor antagonists available, with one study finding an in vitro Ki of 0.17 nM. It is the most potent and selective H1 receptor antagonist of the TCAs (although the tetracyclic antidepressant (TeCA) mirtazapine is slightly more potent), and other sedating antihistamines, for instance the over-the-counter diphenhydramine (Ki = 16 nM) and doxylamine (Ki = 42 nM), show far lower affinities for this receptor in comparison. The affinity of doxepin for the H1 receptor is far greater than its affinity for other sites, and 10- to 100-fold higher doses are needed for antidepressant effects. In accordance, although it is often described as a "dirty drug" due to its highly promiscuous binding profile, doxepin acts as a highly selective antagonist of the H1 receptor at very low doses (less than 10 mg; typically 3 to 6 mg). At these doses, it notably has no clinically relevant anticholinergic effects such as dry mouth or cognitive/memory impairment, unlike most other sedating antihistamines, and similarly has no effect on other receptors such as adrenergic and serotonin receptors. The H1 receptor antagonism of doxepin is responsible for its hypnotic effects and its effectiveness in the treatment of insomnia at low doses. The incidence of side effects with doxepin and its safety at these doses was similar to that of placebo in clinical trials; the most frequent side effects were headache and somnolence/sedation, both with an incidence of less than 5%. Other side effects sometimes associated with antihistamines, including daytime sedation, increased appetite, and weight gain, all were not observed. Clinical evidence of H1 receptor antagonists and TCAs for the treatment insomnia shows mixed effectiveness and is limited in its quality due to weaknesses like small sample sizes and poor generalizability. However, doxepin is a unique and notable exception; it has been well-studied in the treatment of insomnia and shows consistent benefits with excellent tolerability and safety. Aside from diphenhydramine and doxylamine, which have historical approval as hypnotics, doxepin is the only H1 receptor antagonist that is specifically approved for the treatment of insomnia in the United States. The effect sizes of very low-dose doxepin in the treatment of insomnia range from small to medium. These include subjective and objective measures of sleep maintenance, sleep duration, and sleep efficiency. Conversely, very low-dose doxepin shows relatively weak effects on sleep initiation and does not significantly separate from placebo on this measure. This is in contrast to benzodiazepines and nonbenzodiazepine (Z-drug) hypnotics, which are additionally effective in improving sleep onset latency. However, it is also in contrast to higher doses of doxepin (50 to 300 mg/day), which have been found to significantly reduce latency to sleep onset. A positive dose–response relationship on sleep measures was observed for doses of doxepin between 1 and 6 mg in clinical studies, whereas the incidence of adverse effects remained constant across this dose range in both young and older adults. However, the incidence of adverse effects appeared to increase with longer treatment duration. A dose of doxepin as low as 1 mg/day was found to significantly improve most of the assessed sleep measures, but unlike the 3 and 6 mg/day doses, was not able to improve wake time during sleep. This, along with greater effect sizes with the higher doses, was likely the basis for the approval of the 3 and 6 mg doses of doxepin for insomnia and not the 1 mg dose. At very low doses, doxepin has not shown discontinuation or withdrawal effects nor rebound insomnia. Sustained effectiveness without apparent tolerance was demonstrated in clinical studies of up to 12 weeks duration. This appears to be in contrast to over-the-counter antihistamines like diphenhydramine and doxylamine and all other first-generation antihistamines, which are associated with rapid development of tolerance and dependence (by day 3 or 4 of continuous dosing) and loss of hypnotic effectiveness. It is for this reason that, unlike doxepin, they are not recommended for the chronic management of insomnia and are advised for only short-term treatment (i.e., 1 week). It is not entirely clear why doxepin and first-generation antihistamines are different in this regard, but it has been suggested that it may have to do with the lack of selectivity for the H1 receptor of the latter or may have to do with the use of optimal doses. Unlike very-low-dose doxepin, most first-generation antihistamines also have marked anticholinergic activity as well as associated side effects such as dry mouth, constipation, urinary retention, and confusion. This is particularly true in older people, and antihistamines with concomitant anticholinergic effects are not recommended in adults over the age of 65. Anticholinergic activity notably may interfere with the sleep-promoting effects of H1 receptor blockade. Antagonism of the H1, 5-HT2A, 5-HT2C, and α1-adrenergic receptors is thought to have sleep-promoting effects and to be responsible for the sedative effects of TCAs including those of doxepin. Although doxepin is selective for the H1 receptor at doses lower than 25 mg, blockade of serotonin and adrenergic receptors may also be involved in the hypnotic effects of doxepin at higher doses. However, in contrast to very low doses of doxepin, rebound insomnia and daytime sedation are significantly more frequent than placebo with moderate doses (25 to 50 mg/day) of the drug. In addition, one study found that although such doses of doxepin improved sleep measures initially, most of the benefits were lost with chronic treatment (by 4 weeks). Due to limited data however, more research on potential tolerance and withdrawal effects of moderate doses of doxepin is needed. At these doses of doxepin, dry mouth, an anticholinergic effect, was common (71%), and other side effects such as headache (25%), increased appetite (21%), and dizziness (21%) were also frequently observed, although these adverse effects were notably not significantly more frequent than with placebo in the study in question. In any case, taken together, higher doses of doxepin than very low doses are associated with an increased rate of side effects as well as apparent loss of hypnotic effectiveness with chronic treatment. Doxepin at a dose of 25 mg/day for 3 weeks has been found to decrease cortisol levels by 16% in adults with chronic insomnia and to increase melatonin production by 26% in healthy volunteers. In individuals with neuroendocrine dysregulation in the form of nocturnal melatonin deficiency presumably due to chronic insomnia, very-low-dose doxepin was found to restore melatonin levels to near-normal values after 3 weeks of treatment. These findings suggest that normalization of the hypothalamic–pituitary–adrenal axis and the circadian sleep–wake cycle may be involved in the beneficial effects of doxepin on sleep and insomnia. Doxepin has been identified as an inhibitor of CYP2D6 in vivo in a study of human patients being treated with 75 to 250 mg/day for depression. While it significantly altered metabolic ratios for sparteine and its metabolites, doxepin did not convert any of the patients to a different metabolizer phenotype (e.g., extensive to intermediate or poor). Nonetheless, inhibition of CYP2D6 by doxepin could be of clinical importance. Doxepin is well-absorbed from the gastrointestinal tract but between 55 and 87% undergoes first-pass metabolism in the liver, resulting in a mean oral bioavailability of approximately 29%. Following a single very low dose of 6 mg, peak plasma levels of doxepin are 0.854 ng/mL (3.06 nmol/L) at 3 hours without food and 0.951 ng/mL (3.40 nmol/L) at 6 hours with food. Plasma concentrations of doxepin with antidepressant doses are far greater, ranging between 50 and 250 ng/mL (180 to 900 nmol/L). Area-under-curve levels of the drug are increased significantly when it is taken with food. 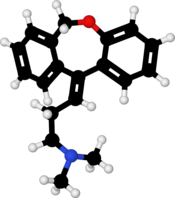 Doxepin is widely distributed throughout the body and is approximately 80% plasma protein-bound, specifically to albumin and α1-acid glycoprotein. Doxepin is extensively metabolized by the liver via oxidation and N-demethylation. Its metabolism is highly stereoselective. Based on in vitro research, the major enzymes involved in the metabolism of doxepin are the cytochrome P450 enzymes CYP2D6 and CYP2C19, with CYP1A2, CYP2C9, and CYP3A4 also involved to a lesser extent. The major active metabolite of doxepin, nordoxepin, is formed mainly by CYP2C19 (>50% contribution), while CYP1A2 and CYP2C9 are involved to a lesser extent, and CYP2D6 and CYP3A4 are not involved. Both doxepin and nordoxepin are hydroxylated mainly by CYP2D6, and both doxepin and nordoxepin are also transformed into glucuronide conjugates. The elimination half-life of doxepin is about 15–18 hours, whereas that of nordoxepin is around 28–31 hours. Up to 10% of Caucasian individuals show substantially reduced metabolism of doxepin that can result in up to 8-fold elevated plasma concentrations of the drug compared to normal. Nordoxepin is a mixture of (E) and (Z) stereoisomers similarly to doxepin. Whereas pharmaceutical doxepin is supplied in an approximate 85:15 ratio mixture of (E)- and (Z)-stereoisomers and plasma concentrations of doxepin remain roughly the same as this ratio with treatment, plasma levels of the (E)- and (Z)-stereoisomers of nordoxepin, due to stereoselective metabolism of doxepin by cytochrome P450 enzymes, are approximately 1:1. Since doxepin is mainly metabolized by CYP2D6, CYP2C9, and CYP2C19, genetic variations within the genes coding for these enzymes can affect its metabolism, leading to changes in the concentrations of the drug in the body. Increased concentrations of doxepin may increase the risk for side effects, including anticholinergic and nervous system adverse effects, while decreased concentrations may reduce the drug's efficacy. Individuals can be categorized into different types of cytochrome P450 metabolizers depending on which genetic variations they carry. These metabolizer types include poor, intermediate, extensive, and ultrarapid metabolizers. Most people are extensive metabolizers, and have "normal" metabolism of doxepin. Poor and intermediate metabolizers have reduced metabolism of the drug as compared to extensive metabolizers; patients with these metabolizer types may have an increased probability of experiencing side effects. Ultrarapid metabolizers break down doxepin much faster than extensive metabolizers; patients with this metabolizer type may have a greater chance of experiencing pharmacological failure. A study assessed the metabolism of a single 75 mg oral dose of doxepin in healthy volunteers with genetic polymorphisms in CYP2D6, CYP2C9, and CYP2C19 enzymes. In CYP2D6 extensive, intermediate, and poor metabolizers, the mean clearance rates of (E)-doxepin were 406, 247, and 127 L/hour, respectively (~3-fold difference between extensive and poor). In addition, the bioavailability of (E)-doxepin was about 2-fold lower in extensive relative to poor CYP2D6 metabolizers, indicating a significant role of CYP2D6 in the first-pass metabolism of (E)-doxepin. The clearance of (E)-doxepin in CYP2C9 slow metabolizers was also significantly reduced at 238 L/hour. CYP2C19 was involved in the metabolism of (Z)-doxepin, with clearance rates of 191 L/hour in CYP2C19 extensive metabolizers and 73 L/hour in poor metabolizers (~2.5-fold difference). Area-under-the-curve (0–48 hour) levels of nordoxepin were dependent on the genotype of CYP2D6 with median values of 1.28, 1.35, and 5.28 nM•L/hour in CYP2D6 extensive, intermediate, and poor metabolizers, respectively (~4-fold difference between extensive and poor). Taken together, doxepin metabolism appears to be highly stereoselective, and CYP2D6 genotype has a major influence on the pharmacokinetics of (E)-doxepin. Moreover, CYP2D6 poor metabolizers, as well as patients taking potent CYP2D6 inhibitors (which can potentially convert a CYP2D6 extensive metabolizer into a poor metabolizer), may be at an increased risk for adverse effects of doxepin due to their slower clearance of the drug. Another study assessed doxepin and nordoxepin metabolism in CYP2D6 ultra-rapid, extensive, and poor metabolizers following a single 75 mg oral dose. They found up to more than 10-fold variation in total exposure to doxepin and nordoxepin between the different groups. The researchers suggested that in order to achieve equivalent exposure, based on an average dose of 100%, the dosage of doxepin might be adjusted to 250% in ultra-rapid metabolizers, 150% in extensive metabolizers, 50% in intermediate metabolizers, and 30% in poor metabolizers. Doxepin is a tricyclic compound, specifically a dibenzoxepin, and possesses three rings fused together with a side chain attached in its chemical structure. It is the only TCA with a dibenzoxepin ring system to have been marketed. Doxepin is a tertiary amine TCA, with its side chain-demethylated metabolite nordoxepin being a secondary amine. Other tertiary amine TCAs include amitriptyline, imipramine, clomipramine, dosulepin (dothiepin), and trimipramine. Doxepin is a mixture of (E) and (Z) stereoisomers (the latter being known as cidoxepin or cis-doxepin) and is used commercially in a ratio of approximately 85:15. The chemical name of doxepin is (E/Z)-3-(dibenzo[b,e]oxepin-11(6H)-ylidene)-N,N-dimethylpropan-1-amine and its free base form has a chemical formula of C19H21NO with a molecular weight of 279.376 g/mol. The drug is used commercially almost exclusively as the hydrochloride salt; the free base has been used rarely. The CAS Registry Number of the free base is 1668-19-5 and of the hydrochloride is 1229-29-4. Doxepin was discovered in Germany in 1963 and was introduced in the United States as an antidepressant in 1969. It was subsequently approved at very low doses in the United States for the treatment of insomnia in 2010. Doxepin is the generic name of the drug in English and German and its INN and BAN, while doxepin hydrochloride is its USAN, USP, BANM, and JAN. Its generic name in Spanish and Italian and its DCIT are doxepina, in French and its DCF are doxépine, and in Latin is doxepinum. The cis or (Z) stereoisomer of doxepin is known as cidoxepin, and this is its INN while cidoxepin hydrochloride is its USAN. As of October 2017[update], doxepin is marketed under many brand names worldwide: Adnor, Anten, Antidoxe, Colian, Deptran, Dofu, Doneurin, Dospin, Doxal, Doxepini, Doxesom, Doxiderm, Flake, Gilex, Ichderm, Li Ke Ning, Mareen, Noctaderm, Oxpin, Patoderm, Prudoxin, Qualiquan, Quitaxon, Sagalon, Silenor, Sinepin, Sinequan, Sinquan, and Zonalon. It is also marketed as a combination drug with levomenthol under the brand name Doxure. The oral formulations of doxepin are FDA-approved for the treatment of depression and sleep-maintenance insomnia and its topical formulations are FDA-approved the short-term management for some itchy skin conditions. Whereas in Australia and the United Kingdom, the only licensed indication(s) is/are in the treatment of major depression and pruritus in eczema, respectively. As of 2017 there was no good evidence that topical doxepin was useful to treat localized neuropathic pain. Cidoxepin is under development by Elorac, Inc. for the treatment of chronic urticaria (hives). As of 2017, it is in phase II clinical trials for this indication. The drug was also under investigation for the treatment of allergic rhinitis, atopic dermatitis, and contact dermatitis, but development for these indications was discontinued. Doxepin was under development by Winston Pharmaceuticals in an intranasal formulation for the treatment of headache. As of August 2015, it was in phase II clinical trials for this indication. ^ a b "Doxepin Hydrochloride". Martindale: The Complete Drug Reference. London, UK: Pharmaceutical Press. 30 January 2013. Retrieved 3 December 2013. ^ a b c d e "International brands of doxepin". Drugs.com. Retrieved 25 October 2017. ^ a b c d e f J. Elks (14 November 2014). The Dictionary of Drugs: Chemical Data: Chemical Data, Structures and Bibliographies. Springer. pp. 469–. ISBN 978-1-4757-2085-3. ^ a b c d e f g h i j k l m n o p q r s t u v w x y z Weber J, Siddiqui MA, Wagstaff AJ, McCormack PL (2010). "Low-dose doxepin: in the treatment of insomnia". CNS Drugs. 24 (8): 713–20. doi:10.2165/11200810-000000000-00000. PMID 20658801. ^ a b c d e f g h i j k Thomas L. Lemke; David A. Williams (24 January 2012). Foye's Principles of Medicinal Chemistry. Lippincott Williams & Wilkins. pp. 604–. ISBN 978-1-60913-345-0. ^ a b Yan JH, Hubbard JW, McKay G, Korchinski ED, Midha KK (2002). "Absolute bioavailability and stereoselective pharmacokinetics of doxepin". Xenobiotica. 32 (7): 615–23. doi:10.1080/00498250210131879. PMID 12162857. ^ a b c d e f g h i j k l m n o p "Sinepin Capsules 25mg - Summary of Product Characteristics (SPC)". UK Electronic Medicines Compendium. 22 January 2014. Retrieved 24 October 2017. ^ a b c d e f g h i j "Doxepin Hydrochloride". Drugs.com. American Society of Health-System Pharmacists. Retrieved 20 March 2019. ^ Yeung, WF; Chung, KF; Yung, KP; Ng, TH (February 2015). "Doxepin for insomnia: a systematic review of randomized placebo-controlled trials". Sleep Medicine Reviews. 19: 75–83. doi:10.1016/j.smrv.2014.06.001. PMID 25047681. ^ a b c British national formulary : BNF 76 (76 ed.). Pharmaceutical Press. 2018. p. 372. ISBN 9780857113382. ^ "Doxepin Use During Pregnancy". Drugs.com. Retrieved 21 March 2019. ^ a b Sateia, MJ; Buysse, DJ; Krystal, AD; Neubauer, DN; Heald, JL (15 February 2017). "Clinical Practice Guideline for the Pharmacologic Treatment of Chronic Insomnia in Adults: An American Academy of Sleep Medicine Clinical Practice Guideline". Journal of Clinical Sleep Medicine. 13 (2): 307–349. doi:10.5664/jcsm.6470. PMC 5263087. PMID 27998379. ^ Qaseem, A; Kansagara, D; Forciea, MA; Cooke, M; Denberg, TD; Clinical Guidelines Committee of the American College of, Physicians. (19 July 2016). "Management of Chronic Insomnia Disorder in Adults: A Clinical Practice Guideline From the American College of Physicians". Annals of Internal Medicine. 165 (2): 125–33. doi:10.7326/M15-2175. PMID 27136449. ^ Brasure, Michelle; MacDonald, Roderick; Fuchs, Erika; Olson, Carin M.; Carlyle, Maureen; Diem, Susan; Koffel, Erin; Khawaja, Imran S.; Ouellette, Jeannine; Butler, Mary; Kane, Robert L.; Wilt, Timothy J. (2015). "Management of Insomnia Disorder: Executive Summary". Agency for Healthcare Research and Quality Report No. 15(16)-EHC027-EF. AHRQ Comparative Effectiveness Reviews. Agency for Healthcare Research and Quality (US). PMID 26844312. ^ Eschler, DC; Klein, PA (August 2010). "An evidence-based review of the efficacy of topical antihistamines in the relief of pruritus". Journal of Drugs in Dermatology. 9 (8): 992–7. PMID 20684150. ^ Fernando, S; Broadfoot, A (March 2010). "Chronic urticaria--assessment and treatment" (PDF). Australian Family Physician. 39 (3): 135–8. PMID 20369115. ^ a b c d e f g h i j k "Deptran Doxepin (as hydrochloride)" (PDF). TGA eBusiness Services. Alphapharm Pty Ltd. 6 May 2013. Retrieved 3 December 2013. ^ "Silenor (doxepin) dosing, indications, interactions, adverse effects, and more". Medscape Reference. WebMD. Retrieved 3 December 2013. ^ a b c d e f g h i j k l m n o p q r s Krystal AD, Richelson E, Roth T (2013). "Review of the histamine system and the clinical effects of H1 antagonists: basis for a new model for understanding the effects of insomnia medications". Sleep Med Rev. 17 (4): 263–72. doi:10.1016/j.smrv.2012.08.001. PMID 23357028. ^ a b c d e f g h Cusack B, Nelson A, Richelson E (1994). "Binding of antidepressants to human brain receptors: focus on newer generation compounds". Psychopharmacology. 114 (4): 559–65. doi:10.1007/bf02244985. PMID 7855217. ^ Gumilar F, Bouzat C (2008). "Tricyclic antidepressants inhibit homomeric Cys-loop receptors by acting at different conformational states". Eur. J. Pharmacol. 584 (1): 30–9. doi:10.1016/j.ejphar.2008.01.023. PMID 18314100. ^ Monsma FJ, Shen Y, Ward RP, Hamblin MW, Sibley DR (1993). "Cloning and expression of a novel serotonin receptor with high affinity for tricyclic psychotropic drugs". Mol. Pharmacol. 43 (3): 320–7. PMID 7680751. ^ Nguyen T, Shapiro DA, George SR, et al. (2001). "Discovery of a novel member of the histamine receptor family". Mol. Pharmacol. 59 (3): 427–33. PMID 11179435. ^ a b Richelson E, Nelson A (1984). "Antagonism by antidepressants of neurotransmitter receptors of normal human brain in vitro". J. Pharmacol. Exp. Ther. 230 (1): 94–102. PMID 6086881. ^ Duncan RS, McPate MJ, Ridley JM, Gao Z, James AF, Leishman DJ, Leaney JL, Witchel HJ, Hancox JC (2007). "Inhibition of the HERG potassium channel by the tricyclic antidepressant doxepin". Biochem. Pharmacol. 74 (3): 425–37. doi:10.1016/j.bcp.2007.04.024. PMC 1920586. PMID 17560554. ^ Bertelsen, Anne K.; Backonja, Misha-Miroslav (2007). "Drugs Targeting Voltage-Gated Sodium and Calcium Channels": 651–651. doi:10.1007/978-3-540-29805-2_1205. ^ Cohen GL (2005). "Migraine prophylactic drugs work via ion channels". Med. Hypotheses. 65 (1): 114–22. doi:10.1016/j.mehy.2005.01.027. PMID 15893128. ^ a b c d e f g h i Singh H, Becker PM (2007). "Novel therapeutic usage of low-dose doxepin hydrochloride". Expert Opin Investig Drugs. 16 (8): 1295–305. doi:10.1517/13543784.16.8.1295. PMID 17685877. ^ a b c Lankford, Alan (2011). "Low-dose doxepin (3 and 6 mg) for the treatment of insomnia". Future Neurology. 6 (2): 143–154. doi:10.2217/fnl.10.83. ISSN 1479-6708. ^ a b c Neal R. Cutler; John J. Sramek; Prem K. Narang (20 September 1994). Pharmacodynamics and Drug Development: Perspectives in Clinical Pharmacology. John Wiley & Sons. pp. 160–. ISBN 978-0-471-95052-3. ^ a b c Pavel Anzenbacher; Ulrich M. Zanger (23 February 2012). Metabolism of Drugs and Other Xenobiotics. John Wiley & Sons. pp. 302–. ISBN 978-3-527-64632-6. ^ Alan F. Schatzberg; Charles B. Nemeroff (2009). The American Psychiatric Publishing Textbook of Psychopharmacology. American Psychiatric Pub. pp. 264–. ISBN 978-1-58562-309-9. ^ a b c d e f g Rojas-Fernandez CH, Chen Y (2014). "Use of ultra-low-dose (≤6 mg) doxepin for treatment of insomnia in older people". Can Pharm J. 147 (5): 281–9. doi:10.1177/1715163514543856. PMC 4213269. PMID 25364337. ^ a b c d e f g h i j k l m n o p q r s t u Yeung WF, Chung KF, Yung KP, Ng TH (2015). "Doxepin for insomnia: a systematic review of randomized placebo-controlled trials". Sleep Med Rev. 19: 75–83. doi:10.1016/j.smrv.2014.06.001. PMID 25047681. ^ a b c d Gillman PK (2007). "Tricyclic antidepressant pharmacology and therapeutic drug interactions updated". Br. J. Pharmacol. 151 (6): 737–48. doi:10.1038/sj.bjp.0707253. PMC 2014120. PMID 17471183. ^ Tariq SH, Pulisetty S (2008). "Pharmacotherapy for insomnia". Clin. Geriatr. Med. 24 (1): 93–105, vii. doi:10.1016/j.cger.2007.08.009. PMID 18035234. ^ Laurence Brunton; Bruce A. Chabner; Bjorn Knollman (14 January 2011). Goodman and Gilman's The Pharmacological Basis of Therapeutics, Twelfth Edition. McGraw Hill Professional. p. 410. ISBN 978-0-07-176939-6. ^ a b c d e f g Stahl SM (2008). "Selective histamine H1 antagonism: novel hypnotic and pharmacologic actions challenge classical notions of antihistamines". CNS Spectr. 13 (12): 1027–38. doi:10.1017/s1092852900017089. PMID 19179941. ^ Richelson E (1979). "Tricyclic antidepressants and histamine H1 receptors". Mayo Clin. Proc. 54 (10): 669–74. PMID 39202. ^ Alan F. Schatzberg; Charles B. Nemeroff (10 May 2017). The American Psychiatric Association Publishing Textbook of Psychopharmacology. American Psychiatric Pub. pp. 322–. ISBN 978-1-61537-122-8. ^ Stahl SM (2009). "Multifunctional drugs: a novel concept for psychopharmacology". CNS Spectr. 14 (2): 71–3. doi:10.1017/s1092852900000213. PMID 19238121. ^ a b c d e f g h Vande Griend JP, Anderson SL (2012). "Histamine-1 receptor antagonism for treatment of insomnia". J Am Pharm Assoc. 52 (6): e210–9. doi:10.1331/JAPhA.2012.12051. PMID 23229983. ^ "Sleep Disorder (Sedative-Hypnotic) Drug Information - U.S. FDA". 13 June 2017. Retrieved 9 August 2017. ^ a b Katwala, Jigar; Kumar, Ananda K; Sejpal, Jaykumar J; Terrence, Marcelle; Mishra, Manish (2013). "Therapeutic rationale for low dose doxepin in insomnia patients". Asian Pacific Journal of Tropical Disease. 3 (4): 331–336. doi:10.1016/S2222-1808(13)60080-8. ISSN 2222-1808. PMC 4027305. In general, sedating properties of anti-depressant agents are related to antagonism of serotonin 5HT2, histamines, and α-1 adrenergic receptors–. ^ Landolt HP, Wehrle R (2009). "Antagonism of serotonergic 5-HT2A/2C receptors: mutual improvement of sleep, cognition and mood?". Eur. J. Neurosci. 29 (9): 1795–809. doi:10.1111/j.1460-9568.2009.06718.x. PMID 19473234. ^ Broese M, Riemann D, Hein L, Nissen C (2012). "α-Adrenergic receptor function, arousal and sleep: mechanisms and therapeutic implications". Pharmacopsychiatry. 45 (6): 209–16. doi:10.1055/s-0031-1299728. PMID 22290201. ^ a b c Szewczuk-Bogusławska M, Kiejna A, Beszłej JA, Orzechowska-Juzwenko K, Milejski P (2004). "Doxepin inhibits CYP2D6 activity in vivo". Pol J Pharmacol. 56 (4): 491–4. PMID 15520506. ^ Leucht S, Steimer W, Kreuz S, Abraham D, Orsulak PJ, Kissling W (2001). "Doxepin plasma concentrations: is there really a therapeutic range?". J Clin Psychopharmacol. 21 (4): 432–9. doi:10.1097/00004714-200108000-00011. PMID 11476128. ^ Virtanen R, Iisalo E, Irjala K (1982). "Protein binding of doxepin and desmethyldoxepin". Acta Pharmacol Toxicol. 51 (2): 159–64. PMID 7113722. ^ a b c d e f g h i j Kirchheiner J, Meineke I, Müller G, Roots I, Brockmöller J (2002). "Contributions of CYP2D6, CYP2C9 and CYP2C19 to the biotransformation of E- and Z-doxepin in healthy volunteers". Pharmacogenetics. 12 (7): 571–80. doi:10.1097/00008571-200210000-00010. PMID 12360109. ^ Härtter S, Tybring G, Friedberg T, Weigmann H, Hiemke C (2002). "The N-demethylation of the doxepin isomers is mainly catalyzed by the polymorphic CYP2C19". Pharm. Res. 19 (7): 1034–7. PMID 12180536. ^ a b c d Kirchheiner J, Henckel HB, Franke L, Meineke I, Tzvetkov M, Uebelhack R, Roots I, Brockmöller J (2005). "Impact of the CYP2D6 ultra-rapid metabolizer genotype on doxepin pharmacokinetics and serotonin in platelets". Pharmacogenet. Genomics. 15 (8): 579–87. doi:10.1097/01.fpc.0000167331.30905.9e. PMID 16007002. ^ Virtanen R, Scheinin M, Iisalo E (1980). "Single dose pharmacokinetics of doxepin in healthy volunteers". Acta Pharmacol Toxicol. 47 (5): 371–6. PMID 7293791. ^ Manuchair Ebadi (31 October 2007). Desk Reference of Clinical Pharmacology, Second Edition. CRC Press. pp. 329–. ISBN 978-1-4200-4744-8. ^ Shufeng Zhou (6 April 2016). Cytochrome P450 2D6: Structure, Function, Regulation and Polymorphism. CRC Press. pp. 142–. ISBN 978-1-4665-9788-4. ^ a b Chambers, Michael. "ChemIDplus - 1668-19-5 - ODQWQRRAPPTVAG-GZTJUZNOSA-N - Doxepin [INN:BAN] - Similar structures search, synonyms, formulas, resource links, and other chemical information". Chem.nlm.nih.gov. Retrieved 16 March 2019. ^ a b c d Index Nominum 2000: International Drug Directory. Taylor & Francis. 2000. pp. 370–. ISBN 978-3-88763-075-1. ^ Adis Editorial (1971). "Doxepin". Drugs. 1 (3): 194–227. doi:10.2165/00003495-197101030-00002. ^ "PRUDOXIN (doxepin hydrochloride) cream". DailyMed. August 2010. Retrieved 3 December 2013. ^ Casale, R; Symeonidou, Z; Bartolo, M (March 2017). "Topical Treatments for Localized Neuropathic Pain". Current Pain and Headache Reports. 21 (3): 15. doi:10.1007/s11916-017-0615-y. PMC 5340828. PMID 28271334. ^ a b c "Cidoxepin". Adisinsight.springer.com. Retrieved 16 March 2019. ^ a b "Doxepin intranasal - Winston Pharmaceuticals". Adisinsight.springer.com. Retrieved 16 March 2019.